Get ready to horse around with the LEGO Friends Heartlake Stables. This adorable set comes with two Friends mini-dolls, Mia and Katharina, along with their two lovely horses. Your child can help the Friends clean the stables, play in the hayloft, and practice jumps for the big riding competition. Heartlake Stables features a separate stall for each horse and a variety of realistic accessories from brushes to saddles (and even a first place ribbon). Includes all of the accessories you need for hours of imagination and fun. Mia and Katharina enjoy cups of cocoa while they take a break. This set features a pink and yellow stable with plenty of room for the two included horses, Bella and Niki, to play around. The stable also includes two stalls and a small field complete with jumping fence. When the Friends are ready to take a break, they can kick back in the hayloft and read a book. Along with the horses, this set comes with an adorable cat and frog mini-figure for extra critter-filled fun. 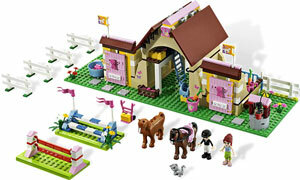 The LEGO Friends Heartlake Stables comes with everything your child needs to build and rebuild the stables. Appropriate for children ages 6 to 12, this set comes with the pieces to build the stable, fences to create a yard or larger practice area, and flower pots to add spots of color or create a garden. There is also a special fence for the riding competition, and blue and white stands for spectators to watch the show. LEGO Friends mini-dolls and bricks are compatible with other LEGO bricks and accessories. The Heartlake Stables provide everything the Friends need to take care of their lovely horses. Your child can saddle up the horses with the included saddles and bridles, then give them a good cleaning with the little brush and comb. Don't forget to have the two included Friends, Mia and Katharina, put on their helmets before they ride. Your child can also use the pitchfork and gardening tools to make sure the stables are neat and tidy, and give the Friends a cup of cocoa for a job well done. LEGO Friends Heartlake Stables (416 pieces) including Mia and Katharina mini-doll figures, Bella and Niki horse figures, accessories, and building instructions.